This technical document provides details and hints regarding the SSL (Secure Sockets Layer) implementation used by StarSQL for Windows and StarPipes for Windows. Both products use Microsoft Secure Channel (Schannel), a standard part of the Windows operating system that facilitates the use of Secure Sockets Layer (SSL) and/or Transport Layer Security (TLS) encryption. Much of the discussion below references StarSQL, but it is also applicable to StarPipes. StarSQL functions as an SSL client, talking to an SSL server implementation running on the DB2 host computer (or to a StarPipes server); StarPipes can act as either a client to the DB2 host or as a server for StarSQL or other DRDA clients (Application Requester) such as StarSQL for Java, the IBM DB2 ODBC driver, or the IBM JCC JDBC driver. Two copies of StarPipes can also be used (where both act as both client and server) to provide SSL communication without changes to existing clients and hosts. Information on configuring SSL on the host computer can be found in the Host Preparation chapter of the StarSQL for Windows User Guide (PDF); refer to the subsections Configuring SSL for DB2 for z/OS, Configuring SSL for DB2 for i, and Configuring SSL for DB2 for LUW. The StarPipes Help (CHM) contains similar host configuration information, plus detailed information on requesting and installing server and client certificates used by StarPipes. 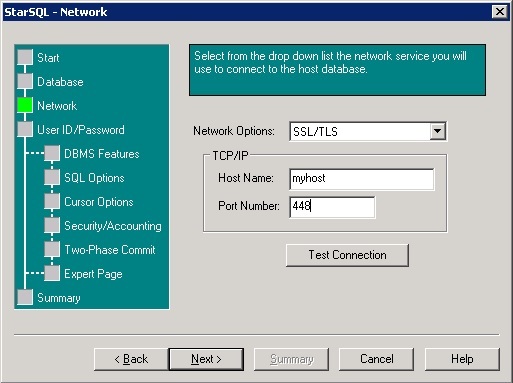 To create a StarSQL ODBC data source utilizing SSL, select SSL/TLS from the Network Options drop-down menu and enter the appropriate host SSL port on the Network panel. Use the Test Connection button to verify the connection is working. Create a registry key HKEY_LOCAL_MACHINE\SOFTWARE\StarQuest\SSA\Server. Create a DWORD entry SchannelEnabledProtocols set to 0xC00. With the goal of implementing easy traffic encryption out-of-the box, StarSQL's default configuration does not require importing the host's Certificate Authority certificate into the local certificate store, and will accept the server certificate received from the host during initial negotiations. Create a DWORD value SchannelFlags and set it to the hex value 0xA34. See below for an explanation of this value. Following are general procedures for configuring SSL on the IBM i host. Refer to your IBM documentation for details..
Start the Admin HTTP instance. To verify that it is running, enter WRKACTJOB JOB(ADMIN). If it is not running, start it with STRTCPSVR SERVER(*HTTP) HTTPSVR(*ADMIN). Use a browser and the URL https://myas400:2001 to connect to the Digital Certificate Manager. On i 6.1 and later, this URL will redirect you to IBM Navigator for i, running on port 2005; from there, select IBM i Tasks Page to see the previous version of the 2001 port tasks, which includes the Digital Certificate Manager. Create a local Certificate Authority or obtain a certificate from a public Internet Certificate Authority. Create a *SYSTEM certificate store. 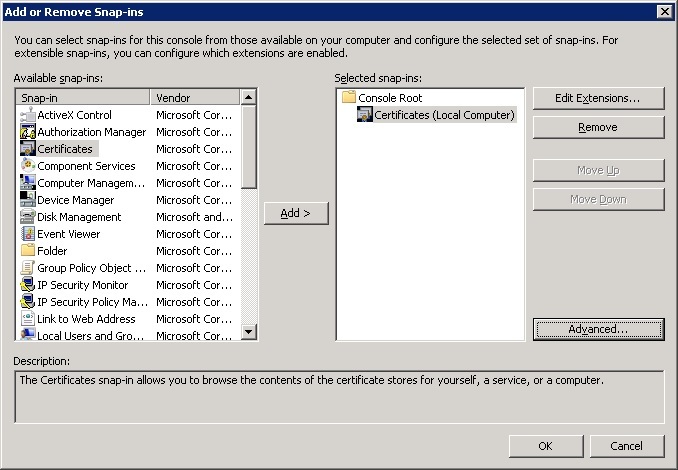 Use Manage Applications to assign a server certificate to the OS/400 DDM/DRDA server. Select Install Local CA Certificate on Your PC from the left column of tasks. You may need to return to the main IBM Navigator for i page and re-enter DCM before Install Local CA Certificate to your PC is visible. Select Copy and paste certificate; this will display the CA certificate in Base64-encoded ASCII data format. Select the contents of the certificate (all of the text from -----BEGIN CERTIFICATE----- through -----END CERTIFICATE-----) and save it in a text file. C> gsk8capicmd_64 -cert -create -db "mydbserver.kdb" -pw "mypassword " -label "SelfSigned" -dn "CN=myhost.mydomain.com,O=MyCompany,OU=CustomerSupport,L=California,ST=ON,C=CA"
Copy the resulting ASCII file to the Windows system. For more information, see Chapter 11.2 Protecting data through DB2 SSL with digital certification of the IBM Redbook Security Functions of IBM DB2 10 for z/OS SG24-7959. Depending on how you plan to use StarSQL, you may choose to import the certificate into the Trusted Root Certificate Authorities section of the certificate store of either the Current User, Local Computer, or a Remote Computer. For this example, we will assume that StarSQL is being used by a service such as SQDR and use the Local Computer store. 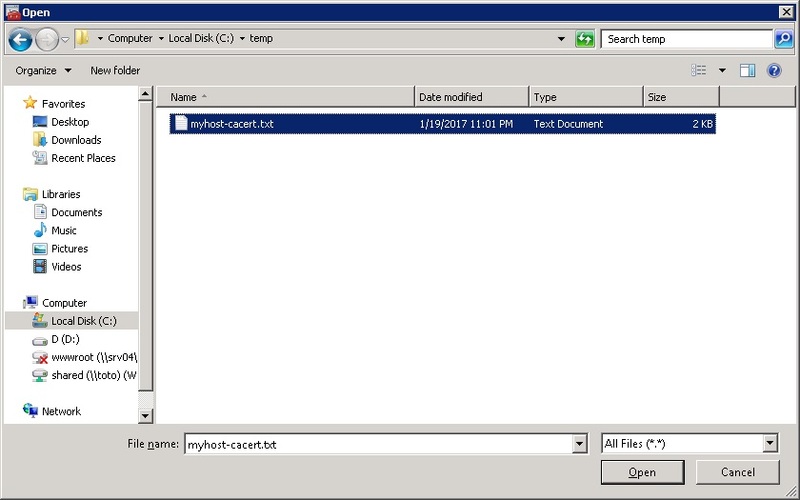 Start mmc (Microsoft Management Console) by typing mmc in a command window, in the Search programs and files box, or the Run.. box. To manage certificates for the local computer, select Local computer, and then click Finish. This will start the Certificate Import Wizard. Click Next. On the File to Import screen, use the Browse button to identify the text file containing the CA certificate exported from the host. If the filename includes an extension other than one of one of the extensions expected by the MMC certificate plugin, select All Files. Click Next. 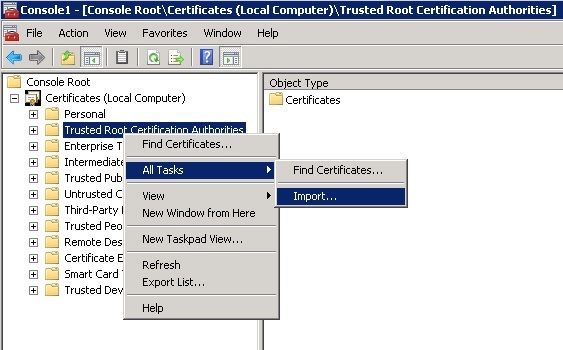 Accept the default of Place all certificates in the following store Trusted Root Certificate Authorities and click Next. These values are optional and should only be entered into the registry to completely override value(s) in the internal SCHANNEL_CRED structure which controls the parameters for the SSL session. These values are applicable on the client and server side of the connection. Optional. A DWORD that contains a bit string that represents the protocols supported by connections made with credentials acquired by using this structure. If this member is zero, Schannel selects the protocol. The global system registry settings take precedence over this value. For example, if SSL3 is disabled in the registry, it cannot be enabled using this member. This member can contain any of the following flags. Secure Sockets Layer 2.0 server side. Superseded by SP_PROT_TLS1_SERVER. Important: Secure Sockets Layer 2.0 and Transport Layer Security 1.2 flags are mutually exclusive. Secure Sockets Layer 2.0 client side. Superseded by SP_PROT_TLS1_CLIENT. Secure Sockets Layer 3.0 server side. Secure Sockets Layer 3.0 client side. Transport Layer Security 1.0 server side. Transport Layer Security 1.0 client side. Transport Layer Security 1.1 server side. Transport Layer Security 1.1 client side. Transport Layer Security 1.2 server side. Transport Layer Security 1.2 client side. Contains bit flags that control the behavior of Schannel. This member can be zero or a combination of the following values. See the Microsoft MSDN SCHANNEL_CRED documentation for details. Minimum bulk encryption cipher strength, in bits, allowed for connections. If this member is zero, Schannel uses the system default. If this member is –1, only the SSL3/TLS MAC–only cipher suites (also known as NULL cipher) are enabled. Maximum bulk encryption cipher strength, in bits, allowed for connections. If this member is zero, Schannel uses the system default. If this member is –1, only the SSL3/TLS MAC–only cipher suites (also known as NULL cipher) are enabled. In this case, dwMinimumCipherStrength must be set to –1. The number of milliseconds that Schannel keeps the session in its session cache. After this time has passed, any new connections between the client and the server require a new Schannel session. Set the value of this member to zero to use the default value of 36000000 milliseconds (ten hours).